Our research interests are focused on the fundamental aspects of Quantum Chemistry, Density-Functional Theory, Computational Chemistry, Theoretical Chemistry, Physical Chemistry, and Molecular Physics. We apply the proper molecular simulation and modeling techniques to understand the behaviors of complex systems in Materials Science, Surface/Interface Chemistry, NanoSystems/NanoMaterials, Catalysis, and Enzymology. The Wiley-International Journal of Quantum Chemistry (IJQC) Young Investigator Award (2007). The Canadian National Committee for the International Union of Pure & Applied Chemistry (CNC-IUPAC) Travel Award (2005). Peter Wall Institute for Advanced Studies Early Career UBC Scholar Award (2003). UCLA Chancellor's Postdoctoral Research Award (2001). Editor, Recent Advances in Orbital-Free Density Functional Theory, edited by T. A. Wesolowski and Y. A. Wang (World Scientific, Singapore, 2011). Guest Editor, Special Issue: Proceedings from the Sixth Congress of the International Society for Theoretical Chemical Physics (ISTCP-VI), in International Journal of Quantum Chemistry, Vol. 109, No. 14, edited by Y. A. Wang, E. J. Brändas, and J. Maruani (Wiley, USA, 2009). Editorial Board Member of Interdisciplinary Sciences: Computational Life Sciences (Springer, Germany), since 2008. Editorial Board Member of Progress in Theoretical Chemistry and Physics (Springer, Germany), since 2007. Editorial Board Member of the Journal of Computational and Theoretical Nanoscience (American Scientific, USA), since 2006. Advisory Board Member of the International Association of Scientists in the Interdisciplinary Areas (IASIA), since 2008. National Representative for Canada to the International Society for Theoretical Chemical Physics (ISTCP), since 2005. Canadian Young Observer to the International Union of Pure and Applied Chemistry (IUPAC) at the 40th IUPAC Congress, Beijing, China, 2005. Adjunct Professor of Theoretical Chemistry (Honorary), Institute for Computational Science and Engineering, Ocean University of China, 2002-2005. Corresponding Symposium Organizer, Symposium on “Orbital-Free Density Functional Theory and Its Applications to Large-Scale Materials Simulations,” The 2010 International Chemical Congress of Pacific Basin Societies (Pacifichem 2010), Honolulu, Hawaii, USA, 15-20 December 2010. Chair, the Sixth Congress of the International Society for Theoretical Chemical Physics (ISTCP-VI), University of British Columbia, Vancouver, Canada, July 19-24 2008. Chair, the Sixth Canadian Computational Chemistry Conference (CCCC6), University of British Columbia, Vancouver, Canada, 26-30 July 2006. Member of the Pacific Institute of Theoretical Physics, UBC, since 2005. 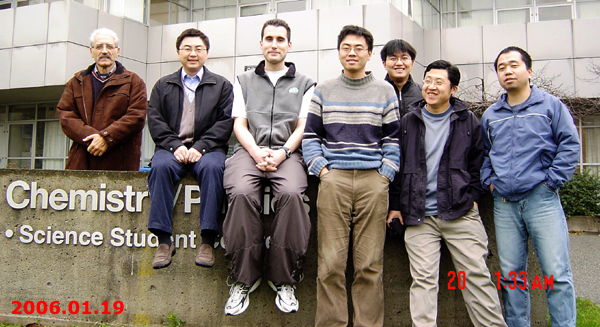 Member of the Institute of Applied Mathematics, UBC, since 2002. Highly accurate predictions of condensed-phase phenomena from first-principles are rare. Current theoretical methods either cannot consistently treat chemical reactions at a high level of accuracy, or are limited by system size or the time scale of the process. To overcome such obstacles, I will initiate a research program to devise better linear-scaling first-principles schemes to study interesting problems in biological systems and materials science, with an equal emphasis on theoretical advances and real-world applications. The ultimate goal is to offer the scientific community a reliable vehicle to qualitatively and quantitatively understand basic mechanisms in complex systems, and to gain insights into aspects of nature that cannot be easily probed by experimental means. The success of ab initio quantum chemistry computational packages (e.g., GAUSSIAN, MOLCAS, HONDO, MELD, etc.) has made conventional ab initio theories essentially "household" names in everyday chemistry. Despite their popularity, these methods cannot be applied to many common chemical problems due to their prohibitive scaling properties, i.e., scaling worse than O(N4) for post-Hartree-Fock methods, where N is the "size" of the system. Among various efforts to surmount this scaling problem, working directly with low-order reduced density matrices has the most promise: accurate energetics with relatively low computational cost and without seriously sacrificing the quality of the wave function. This research area will be one of our primary interests. In addition to the popular Kohn-Sham orbital-based approach to density-functional theory, there is a less-used Hohenberg-Kohn orbital-free density-based scheme. Though linear-scaling Kohn-Sham codes are available, they are computationally expensive due to manipulations of basis sets and Kohn-Sham orbitals, including orbital orthonormalization and orbital localization. In comparison, the orbital-free Hohenberg-Kohn scheme is purely a density-based, linear-scaling method with none of the overhead associated with basis sets and Kohn-Sham orbitals. The orbital-free Hohenberg-Kohn scheme also performs uniformly well with linear-scaling regardless whether or not the first-order reduced density matrix is "nearsighted" (diagonally dominant). With present computational resources, systems of thousands of atoms can be studied with the orbital-free Hohenberg-Kohn scheme; such a size is inconceivable for the present orbital-based ab initio and Kohn-Sham methods. In fact, the orbital-free Hohenberg-Kohn scheme is purely restricted by the physical size of the system under investigation, not by the number of electrons, and certainly has clear advantages over the orbital-based methods. Furthermore, with the help of linear-scaling summation techniques for long-range interactions, significantly larger systems can be modeled dynamically within the density-functional theory description using current computational power. Hence, the orbital-free Hohenberg-Kohn scheme is a much better choice in terms of efficiency and implementation. However, in order to obtain accurate results via the orbital-free Hohenberg-Kohn scheme, one must know all of the components in the total energy density functional. Our task is to design nearly universal, highly accurate, density-only kinetic-energy and exchange-correlation density functionals, such that the orbital-free, linear-scaling Hohenberg-Kohn scheme will become the preferred method of implementation of density-functional theory in the near future. With the advances mentioned in the previous two sections, we then merge them into a coherent embedding formalism and methodology to study chemical and physical processes in complex systems, especially biological systems and condensed-phase materials. The basic idea behind such an embedding scheme is to treat the large surrounding environment by a less computationally intensive method (e.g., density-functional theory), and to apply high-level post-Hartree-Fock methods to the chemical reaction regions such that accurate energetics are obtained. Ultimately, we will be able to develop highly accurate linear-scaling first-principles methods and apply them to reliably predict the behavior of complex systems. During the course of research, graduate students and postdoctoral fellows will be equipped with a broad set of skills and knowledge (physics, chemistry, mathematics, computation, biophysics, and materials science), benefiting their future careeers. B.Sc., Jilin University (China, 1991); Ph.D., Indiana University at Bloomington (Ernest R. Davidson, 1995); Postdoctoral Fellow, University of North Carolina at Chapel Hill (Robert G. Parr, 1995-1997); Postdoctoral Fellow, University of California at Los Angeles (Emily A. Carter, 1997-2001). Tayyari*, S. F. ; Ghafari, M. ; Jamialahmadi, M. ; Chahkandi, B. ; Patrick, B. O. ; Wang, Y. A. Vibrational Assignment And Crystal Structure Of 3-Amino-1-Phenyl-2-Buten-1-One. J. Mol. Struct. 2013, 1045, 20-28. Williams, D. E. ; Dalisay, D. S. ; Li, F. ; Amphlett, J. ; Maneerat, W. ; Chavez, M. A. Garcia; Wang, Y. A. ; Matainaho, T. ; Yu, W. ; Brown, P. J. ; Arrowsmith, C. H. ; Vedadi, M. ; Andersen*, R. J. Nahuoic Acid A Produced By A Streptomyces Sp. Isolated From A Marine Sediment Is A Selective Sam-Competitive Inhibitor Of The Histone Methyltransferase Setd8. Org. Lett. 2013, 15, 414-417. Wesołowski, T. A. ; Wang, Y. A. Recent Advances In Orbital-Free Density Functional Theory; World Scientific: Singapore, 2013. Wesołowski, T. A. ; Wang, Y. A. Preface. In Recent Advances in Orbital-Free Density Functional Theory; Wesołowski, T. A. ; Wang, Y. A. ; Recent Advances in Orbital-Free Density Functional Theory; World Scientific: Singapore, 2013. Wang*, Y. A. ; Xiang, P. From The Hohenberg-Kohn Theory To The Kohn-Sham Equations. In Recent Advances in Orbital-Free Density Functional Theory; Wesołowski, T. A. ; Wang, Y. A. ; Recent Advances in Orbital-Free Density Functional Theory; World Scientific: Singapore, 2013; pp. 3-12. Hepperle, S. S. ; Wang*, Y. A. Comprehensive Computational Study Of Decamethyldizincocene Formation. 2. Reaction Of Kh/zncl2 With Decamethylzincocene. J. Phys. Chem. A 2013, 117, 13161-13165. Daoust, J. ; Chen, M. ; Wang, M. ; Williams, D. E. ; Chavez, M. A. Garcia; Wang, Y. A. ; Merchant, C. E. ; Fontana, A. ; Kieffer, T. J. ; Andersen*, R. J. Sesterterpenoids Isolated From A Northeastern Pacific Phorbas Sp. J. Org. Chem. 2013, 78, 8267-8273. Fleming*, D. G. ; Arseneau, D. J. ; Bridges, M. D. ; Chen, Y. K. ; Wang, Y. A. Hyperfine Coupling Constants Of The Mu-T-Butyl Radical In Nay And Usy Compared With Similar Data In The Bulk And With Ab Initio Theory. J. Phys. Chem. C 2013, 117, 16523-16539. Hepperle, S. S. ; Wang*, Y. A. Comprehensive Computational Study Of Decamethyldizincocene Formation. 1. Reaction Of Znr2 Reagents With Decamethylzincocene. J. Phys. Chem. A 2013, 117, 4657-4663. Chen, Y. K. ; Wang*, Y. A. First-Principles Computational Studies Of The Torsional Potential Energy Surface Of The Sec-Butyl Radical. Can. J. Chem. 2011, 89, 1469-1476. Chen, Y. K. ; Tian, W. Q. ; Wang*, Y. A. Theoretical Studies Of AuM And PtauN Clusters And Their N2 And O2 Adsorption Complexes. Int. J. Quantum Chem. 2011, 112, 65-77. Chen, Y. K. ; Wang*, Y. A. Listb: A Better Direct Approach To List. J. Chem. Theory Comput. 2011, 7, 3045-3048. Yeung, C. S. ; Wang*, Y. A. Lewis Acidity Of Pt-Doped Buckybowls, Fullerenes, And Single-Walled Carbon Nanotubes. J. Phys. Chem. C 2011, 115, 7153-7163. Fleming*, D. G. ; Bridges, M. D. ; Arseneau, D. J. ; Chen, Y. K. ; Wang, Y. A. Isotope Effects And The Temperature Dependences Of The Hyperfine Coupling Constants Of Muoniated Sec-Butyl Radicals In Condensed Phases. J. Phys. Chem. A 2011, 115, 2778-2793. Chen, Y. K. ; Fleming, D. G. ; Wang*, Y. A. Theoretical Calculations Of Hyperfine Coupling Constants For Muoniated Butyl Radicals. J. Phys. Chem. A 2011, 115, 2765-2777. Yeung, C. S. ; Chen, Y. K. ; Wang*, Y. A. Defected And Substitutionally Doped Nanotubes: Applications In Biosystems, Sensors, Nanoelectronics, And Catalysis. In Carbon Nanotubes − Growth and Applications; Marulanda, M. ; Carbon Nanotubes − Growth and Applications; InTech: Vienna, Austria, 2011; pp. 97-132. Wang*, Y. A. ; Yam, C. Y. ; Chen, Y. K. ; Chen*, G. H. Linear-Expansion Shooting Techniques For Accelerating Self-Consistent Field Convergence. J. Chem. Phys. 2011, 134, 241103. Chen, Y. K. ; Liu, L. V. ; Tian, W. Q. ; Wang*, Y. A. Theoretical Studies Of Transition-Metal-Doped Single-Walled Carbon Nanotubes. J. Phys. Chem. C 2011, 115, 9306-9311. Chen, Y. K. ; Liu, L. V. ; Wang*, Y. A. Density Functional Study Of Interaction Of Atomic Pt With Pristine And Stone-Wales-Defective Single-Walled Boron Nitride Nanotubes. J. Phys. Chem. C 2010, 114, 12382-12388. Tian, W. Q. ; Liu, L. V. ; Chen, Y. K. ; Wang*, Y. A. Electronic Structure And Reactivities Of Perfect, Defected, And Doped Single-Walled Carbon Nanotubes. In Trends in Computational Nanomechanics: Transcending Length and Time Scales; Dumitrica, T. ; Trends in Computational Nanomechanics: Transcending Length and Time Scales; Springer: Dordrecht, 2010; pp. 421-471. Liu, L. V. ; Tian, W. Q. ; Chen, Y. K. ; Zhang, Y. A. ; Wang*, Y. A. Theoretical Studies On Structures, 13C Nmr Chemical Shifts, Aromaticity, And Chemical Reactivity Of Finite-Length Open-Ended Armchair Single-Walled Carbon Nanotubes. Nanoscale 2010, 2, 254-261. Yeung, C. S. ; Chen, Y. K. ; Wang*, Y. A. Theoretical Studies Of Substitutionally Doped Single-Walled Nanotubes. J. Nanotechnol. 2010, 2010, Article ID 801789. Tayyari*, S. F. ; Mahdizadeh, S. J. ; Holakoei, S. ; Wang*, Y. A. Vibrational Assignment And Proton Tunneling In Pyridine-Pyridinium Complexes. J. Mol. Struct. 2010, 971, 39-46. Tayyari*, S. F. ; Zahedi-Tabrizi, M. ; Azizi-Toopkanloo, H. ; Hepperle, S. S. ; Wang*, Y. A. The Nature Of Intramolecular Hydrogen Bond In 2-Nitromalonaldehyde. Chem. Phys. 2010, 368, 62-65. Zhang, Y. A. ; Wang*, Y. A. Perturbative Total Energy Evaluation In Self-Consistent Field Iterations: Tests On Molecular Systems. J. Chem. Phys. 2009, 130, 144116. Wang, Y. A. ; Brändas, E. J. ; Maruani, J. Special Issue: Proceedings From The Sixth Congress Of The International Society For Theoretical Chemical Physics (Istcp-Vi); International Journal of Quantum Chemistry; 2009; Vol. 109, pp. 3143-3504. Zhang, Y. A. ; Wang*, Y. A. Are The Unconventional Density Variations Really Unconventional?. Int. J. Quantum Chem. 2009, 109, 3199-3216. Wang, Y. A. ; Brändas, E. J. ; Maruani, J. Special Issue: Proceedings From The Sixth Congress Of The International Society For Theoretical Chemical Physics (Istcp-Vi) Preface. International Journal of Quantum Chemistry 2009, 109, 3143-3144. Yeung, C. S. ; Tian, W. Q. ; Liu, L. V. ; Wang*, Y. A. Chemistry Of Single-Walled Carbon Nanotubes. J. Comput. Theor. Nanosci. 2009, 6, 1213-1235. Zhou, B. J. ; Wang*, Y. A. Accelerating The Convergence Of The Total Energy Evaluation In Density Functional Theory Calculations. J. Chem. Phys. 2008, 128, 084101. Tayyari*, S. F. ; Zahedi-Tabrizi, M. ; Afzali, R. ; Laleh, S. ; Mirshahi, H. - A. ; Wang, Y. A. Structure And Vibrational Assignment Of The Enol Form Of 3-Chloro-Pentane-2,4-Dione. J. Mol. Struct. 2008, 873, 79-88. Tayyari*, S. F. ; Najafi, A. ; Afzali, R. ; Emamian, S. ; Wang, Y. A. Structure And Vibrational Assignment Of The Enol Form Of 1-Chloro-1,1 Difluoro-Pentane-2,4-Dione. J. Mol. Struct. 2008, 878, 10-21. Zhang, Y. A. ; Monga, V. ; Orvig*, C. ; Wang*, Y. A. Theoretical Studies Of The Tautomers Of Pyridinethiones. J. Phys. Chem. A 2008, 112, 3231-3238. Hepperle, S. S. ; Wang*, Y. A. A Brief Computational Study Of Decamethyldizincocene Formation Via Decamethylzincocene And Diethylzinc. J. Phys. Chem. A 2008, 112, 9619-9622. Yeung, C. S. ; Liu, L. V. ; Wang*, Y. A. Novel Nanotube-Coordinated Platinum Complexes. J. Comput. Theor. Nanosci. 2007, 4, 1108-1119. Tayyari*, S. F. ; Vakili, M. ; Nekoei, A. - R. ; Rahemi, H. ; Wang, Y. A. Vibrational Assignment And Structure Of Trifluorobenzoylacetone - A Density Functional Theoretical Study. Spectrochim. Acta A 2007, 66, 626-636. Tayyari*, S. F. ; Zahedi-Tabrizi, M. ; Laleh, S. ; Moosavi-Tekyeh, Z. ; Rahemi, H. ; Wang, Y. A. Structure And Vibrational Assignment Of 3,4-Diacetyl-2,5-Hexanedione. A Density Functional Theoretical Study. J. Mol. Struct. 2007, 827, 176-187. Tayyari*, S. F. ; Rahemi, H. ; Nekoei, A. R. ; Zahedi-Tabrizi, M. ; Wang, Y. A. Vibrational Assignment And Structure Of Dibenzoylmethane - A Density Functional Theoretical Study. Spectrochim. Acta A 2007, 66, 394-404. Zhou, B. ; Wang*, Y. A. An Accurate Total Energy Density Functional. Int. J. Quantum Chem. 2007, 107, 2995-3000. Zhou, B. J. ; Wang*, Y. A. Total Energy Evaluation In The Strutinsky Shell Correction Method. J. Chem. Phys. 2007, 127, 064101. Zhou, B. J. ; Wang*, Y. A. Orbital-Corrected Orbital-Free Density Functional Theory. J. Chem. Phys. 2006, 124, 081107. Tian, W. Q. ; Liu, L. V. ; Wang*, Y. A. Electronic Properties And Reactivity Of The Doped And Defected Single-Walled Carbon Nanotubes. In Handbook of Theoretical and Computational Nanotechnology; Rieth, M. ; Schommers, W. ; Handbook of Theoretical and Computational Nanotechnology; American Scientific: Valencia, California, USA, 2006; Vol. 9, pp. 499-524. Tian, W. Q. ; Liu, L. V. ; Wang*, Y. A. Electronic Properties And Reactivity Of Pt-Doped Carbon Nanotubes. Phys. Chem. Chem. Phys. 2006, 8, 3528-3539. Tian*, W. Q. ; Feng, J. - K. ; Wang, Y. A. ; Aoki, Y. Search For Suitable Approximation Methods For Fullerene Structure And Relative Stability Studies: Case Study With C50. J. Chem. Phys. 2006, 125, 094105. Liu, L. V. ; Tian, W. Q. ; Wang*, Y. A. Ozonization At The Vacancy Defect Site Of The Single-Walled Carbon Nanotube. J. Phys. Chem. B 2006, 110, 13037-13044. Gallant, A. J. ; Hui, J. K. - H. ; Zahariev, F. E. ; Wang*, Y. A. ; MacLachlan*, M. J. Synthesis, Structure, And Computational Studies Of Soluble Conjugated Multidentate Macrocycles. J. Org. Chem. 2005, 70, 7936-7946. Tian, W. Q. ; Wang*, Y. A. Dynamics Of The Staudinger Reaction. J. Chem. Theory Comput. 2005, 1, 353-362. Zahariev, F. E. ; Wang*, Y. A. Extension Of The Universal Density Functional To The Domain Of Unnormalized Densities. In Advances in Computational Methods in Sciences and Engineering 2005, Vols 4 A & 4 B; Simos, T. ; Maroulis, G. ; Advances in Computational Methods in Sciences and Engineering 2005, Vols 4 A & 4 B; 2005; Vol. 4A-4B, pp. 1193-1196. Zhou, B. ; Wang*, Y. A. Recovering Orbital Information From Orbital-Free Density Functional Theory. In Advances in Computational Methods in Sciences and Engineering 2005, Vols 4 A & 4 B; Simos, T. ; Maroulis, G. ; Advances in Computational Methods in Sciences and Engineering 2005, Vols 4 A & 4 B; 2005; Vol. 4A-4B, pp. 1458-1461. Zahariev, F. E. ; Wang*, Y. A. Functional Derivative Of The Universal Density Functional In Fock Space. Phys. Rev. A 2004, 70, 042503. Zhou, B. J. ; Wang, Y. A. ; Carter*, E. A. Transferable Local Pseudopotentials Derived Via Inversion Of The Kohn-Sham Equations In A Bulk Environment. Phys. Rev. B 2004, 69, 125109. Klüner, T. ; Govind, N. ; Wang, Y. A. ; Carter*, E. A. Reply To The Comment On ‘Prediction Of Electronic Excited States Of Adsorbates On Metal Surfaces From First Principles’. Phys. Rev. Lett. 2002, 88, 209702. Klüner, T. ; Govind, N. ; Wang, Y. A. ; Carter*, E. A. Periodic Density Functional Embedding Theory For Complete Active Space Self-Consistent Field And Configuration Interaction Calculations: Ground And Excited States. J. Chem. Phys. 2002, 116, 42-54. Klüner, T. ; Govind, N. ; Wang, Y. A. ; Carter*, E. A. Prediction Of Electronic Excited States Of Adsorbates On Metal Surfaces From First Principles. Phys. Rev. Lett. 2001, 86, 5954-5957. Wang, Y. A. ; Carter*, E. A. Orbital-Free Kinetic-Energy Density Functional Theory. In Theoretical Methods in Condensed Phase Chemistry; Schwartz, S. D. ; Theoretical Methods in Condensed Phase Chemistry; Kluwer: Dordrecht, 2000; pp. 117-184. Govind, N. ; Wang, Y. A. ; Carter*, E. A. Electronic-Structure Calculations By First-Principles Density-Based Embedding Of Explicitly Correlated Systems. J. Chem. Phys. 1999, 110, 7677-7688. Wang, Y. A. ; Govind, N. ; Carter*, E. A. Orbital-Free Kinetic-Energy Density Functionals With A Density-Dependent Kernel. Phys. Rev. B 1999, 60, 16350-16358. Wang, Y. A. ; Carter*, E. A. Improved Lower Bounds For Uncertainty-Like Relationships In Many-Body Systems. Phys. Rev. A 1999, 60, 4153-4155. Wang, Y. A. ; Govind, N. ; Carter*, E. A. Orbital-Free Kinetic-Energy Functionals For The Nearly-Free Electron Gas. Phys. Rev. B 1998, 58, 13465-13471. Govind, N. ; Wang, Y. A. ; da Silva, A. J. R. ; Carter*, E. A. Accurate Ab Initio Energetics Of Extended Systems Via Explicit Correlation Embedded In A Density-Functional Environment. Chem. Phys. Lett. 1998, 295, 129-134. Yang*, Z. - Z. ; Wang, Y. A. ; Liu, S. - B. The Single-Electron Local Kinetic Energy. Sci. China Ser. B 1998, 41, 174-181. Rolke, J. ; Zheng, Y. ; Brion*, C. E. ; Wang, Y. A. ; Davidson, E. R. Valence Orbital Electron Momentum Distributions For Oxygen: Comparison Of Ems Measurements With Theory. Chem. Phys. 1998, 230, 153-186. Wang*, Y. A. Coordinate Scaling And Adiabatic-Connection Formulation In Density-Functional Theory. Phys. Rev. A 1997, 56, 1646-1649. Wang*, Y. A. Natural Variables For Density Functionals. Phys. Rev. A 1997, 55, 4589-4592. Parr*, R. G. ; Wang, Y. A. The Kohn-Sham Method As A Free Energy Minimization At Infinite Temperature. Phys. Rev. A 1997, 55, 3226-3228. Wang*, Y. A. Padé Approximants In Density-Functional Theory. Chem. Phys. Lett. 1997, 268, 76-85. Wang*, Y. A. ; Liu, S. ; Parr, R. G. Laurent Series Expansions In Density-Functional Theory. Chem. Phys. Lett. 1997, 267, 14-22. Yang, Z. - Z. ; Liu, S. ; Wang*, Y. A. Uniqueness And Asymptotic Behavior Of The Local Kinetic Energy. Chem. Phys. Lett. 1996, 258, 30-36. Davidson*, E. R. ; Wang, Y. A. Ab Initio Calculations On Excited Molecular Ions Of Ethylene And Acetylene. Aust. J. Phys. 1996, 49, 247-260. Rolke, J. ; Cann, N. ; Zheng, Y. ; Hollebone, B. P. ; Brion*, C. E. ; Wang, Y. A. ; Davidson, E. R. Momentum Profiles For Open-Shell Molecules: Studies Of The Homo's Of No, O2, And No2 By Electron Momentum Spectroscopy And Scf, Post-Hartree-Fock And Dft Calculations. Chem. Phys. 1995, 201, 1-21. Moghaddam, M. S. ; Dejardins, S. J. ; Bawagan*, A. D. O. ; Tan, K. H. ; Wang, Y. ; Davidson, E. R. Study Of Correlation States Of Acetylene By Synchrotron Photoelectron Spectroscopy. J. Chem. Phys. 1995, 103, 10537-10547. Hollebone, B. P. ; Neville, J. J. ; Zheng, Y. ; Brion*, C. E. ; Wang, Y. ; Davidson, E. R. Valence Electron Momentum Distributions Of Ethylene: Comparison Of Ems Measurements With Near Hartree-Fock Limit, Configuration Interaction And Density Functional Theory Calculations. Chem. Phys. 1995, 196, 13-35. Desjardins, S. J. ; Bawagan*, A. D. O. ; Liu, Z. F. ; Tan, K. H. ; Wang, Y. ; Davidson, E. R. Correlation States Of Ethylene. J. Chem. Phys. 1995, 102, 6385-6399. Zheng, Y. ; Neville, J. J. ; Brion*, C. E. ; Wang, Y. ; Davidson, E. R. An Electronic Structure Study Of Acetone By Electron Momentum Spectroscopy: A Comparison With Scf, Mrsd-Ci And Density Functional Theory. Chem. Phys. 1994, 188, 109-129. Desjardins, S. J. ; Bawagan*, A. D. O. ; Tan, K. H. ; Wang, Y. ; Davidson, E. R. The Interesting Photon Energy Dependence Of A Correlation Peak Of Ethylene. Chem. Phys. Lett. 1994, 227, 519-526. Hollebone, B. P. ; Duffy, P. ; Brion*, C. E. ; Wang, Y. ; Davidson, E. R. An Investigation Of The Outermost Orbital Momentum Distributions Of Formaldehyde, Acetaldehyde And Acetone, By Electron Momentum Spectroscopy And The Quantum Chemical Calculations At The Scf And Mrsd-Ci Levels. Chem. Phys. 1993, 178, 25-38.